Makeup Remastered- reinvent yourself daily: Presenting :Charlotte Tilbury Colour Chameleon in Bronzed Garnet, Amethyst Aphrodisiac and Dark Pearl - Darling! Presenting :Charlotte Tilbury Colour Chameleon in Bronzed Garnet, Amethyst Aphrodisiac and Dark Pearl - Darling! If you have been living under a rock, I might forgive you for not knowing about Charlotte Tilbury and her new makeup collection. A huge offering for a new luxury line, from foundations, eyelash curlers and gorgeous eye palettes. You are spoilt for choice as you choose which alter ego you will be today. This concept of reinvention is of course what I love. Today I will show you three of her Colour Chameleon Colour morphing eye shadow pencils - Amethyst Aphrodisiac (night), Bronzer Garnet (day) and Dark Pearl (day). 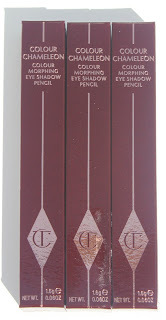 These pencils are paired in to day/night options with them being best to enhance your eye colour. The latter two I bought, are meant for green eyes and the Dark Pearl the day option for brown eyes. I have brown eyes and thought the two pencils for green eyes would bring out more of the greenish flecks, plus I love these shades (rules are mean't to be broken?!). The retro styled packaging is fresh and new. The colours of the pencils are colour coded on the ends for easy use. Bronzed Garnet is a bronze shade warmed with the light of the red tone of a garnet. Dark Pearl is a taupe that in different lights and skin tones will pull more gold or purple. Amethyst Aphrodisiac is a warm gem purple. These shades are all metallic. I did not find them particularly shimmery or sparkly, but strongly pigmented. I wore it straight onto the lid with no primer. It wore seven hours, when I did experience some fading. Once applied they dry quickly, so work fast if you want to blend. I suggest a brush with a bit of firmness.You could layer some shadows over for extra impact or keep it simple as one shade. They set with no tacky feeling when opening your lids, which I sometimes experience with some of my other shadow sticks. 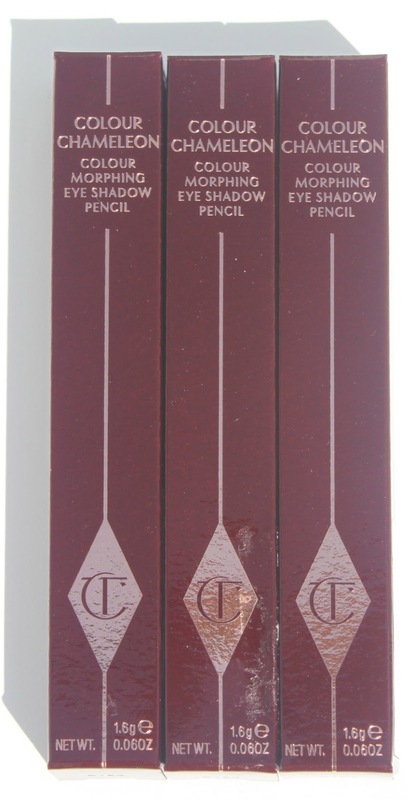 A simple intense eye can be achieved with the cute pencil, in no time at all. They are quite stout, so I am hoping I will not sharpen them away in one twist! If you were like me and starved for reviews and swatches on the Charlotte Tilbury collection, I do hope this helps. Are you loving this collection as much as I am? I have quite a few more Charlotte Tilbury product to review for you all. Also a heads up if you are still living under that rock :)- Wayne Goss of waynegossmakeupartist fame is launching his makeup brushes tomorrow - ready...get set .....go! My want list for CT is endless. Dark Pearl is a neutral lover's dream. I am waiting for my luxury eye palettes and cheek colour to arrive- which shade did u get and what do think? I also bought uptown girl and cannot wait to try it -Whats your absolute must have from her range? Thanks Sara- did you by any CT?- I forgot to mention that while there was fading there was NO creasing at all! Happy to be of service to a fellow beauty lover- Please report back on all the CT goodies you get at Selfridges- Check out the Feline Flick liner- that is beyond excellent- review soon- love it so much! I am glad the swatches were helpful! I have yet to be disappointed with a CT product and always anticipate new products with great excitement!